Today we have introduced a new feature called Splat! Split. Splat! Split enables you to purchase and download individual games from our feature shows. We are currently testing out Splat! Split on one show, Adam and Jon’s Final Battle. We will consider rolling out Splat! Split to other shows if there is enough demand for it. It’s still cheaper to buy the full shows instead of buying each game individually but we are giving you more options in case you just want to watch one segment or game. You will find Splat! Split on the Adam and Jon: Final Battle show page after the show description. Our Spring Sale is now on and includes a good number of shows taking part. Add to your Splat! Show collection today with our great offer of 50% off selected shows UNTIL END OF MAY. Happy Easter From The Splat! Show! We haven’t been able to produce a brand new Easter themed Splat! Show this year. We have been too busy meeting many of you at private experiences and producing our season 17 opener shows to get a new easter show done this year. But we have re-released last years fantastic easter special with Joe and Kyle at just £9.99 reduced from the usual £16.50. The show has been locked away until today and will only be available until next Tuesday, April 23rd. Happy Easter from us all here at The Splat! Show. Season 17 Launched – TWO Brand New Shows and Guests! Season 17 is here! To launch the brand new season of The Splat! Show we have released not one, but two new feature length Splat! Shows featuring two brand new guests. We are incredibly proud of these two brand new shows and we really hope you enjoy the work and effort that went into their creation. We are especially excited about our new season 17 competition, Tour De Gunge that will be running throughout the season. Go and check out Oliver (who wants to be a Splat! Star) and the marvellous Marius in their respective shows. Enjoy. After going head to head in two previous feature shows to try and escape The Gunge Tank, Adam and Jon take on their final battle. Their final head to head feature show is out now. This time Jon lost out and got tanked the most and Adam was crowned the victor! Don’t miss the feature length show that is out including some bonuses if you download before the end of April. Our vault breakout thats running for our 15th anniversary has been updated. This months breakout is the Arron (and Jon) Splat! Storm reshoot from 2017. It’s available to download until May 1st. Private Experience Bookings For June – August NOW OPEN! Bookings for our private experiences to take place in June – August are now open. If you have ever wanted to appear on The Splat! Show but don’t want your show released then our private experiences are for you. Our private experience page contains all the information you need so go and take a read, and don’t forget to read the testimonials from previous guests who have booked and loved their private experience with us. We will protect your privacy at all times and give you an experience you will never forget. We offer four tiers of private experiences, so whatever you want we have an experience to match your budget. Available dates for private experiences are limited so if you want to book one then we strongly suggest you contact us asap. With our first feature length show for well over two months now out (go and check it out, it’s a good’un) we are finally back in the game with show production. Thanks for bearing with us as we got the new site up to speed. While there are many new site features to come, the basic site structure is working well which means we have more free time for the actual shows. Here is some of the highlights you might of missed over the past week or so. We have introduced a brand new feature on The Splat! Fan Club, Splat! Retro Stream. Every month we will be posting two “Retro” videos on the club for members to stream as part of their monthly Splat! Fan Club membership. “Retro” videos are the videos that did not move to our new website. We did offer these videos at sale before the old site shut down, but if you didn’t manage to download them you can now stream two a month going forward on The Splat! Fan Club. The first two shows streaming are Jamie’s Touchy Feely and Paddy’s U Control. LEARN MORE ABOUT SPLAT! RETRO STREAM HERE Please note that shows currently on the website will not be coming to Splat! Retro Stream at this time or in the near future. Can’t access the Fan Club because your payment method isn’t accepted? Well we now have a work around. If you wish to join the fan club but are having payment issues. Please contact us here telling us and we will be able to sign you up. The initial response to our brand new Private Experiences has been phenomenal with available slots selling out fast. We have now been able to add two one more available slots for the March – May period. These will probably sell out fast too, so if you want to book a Splat! Show private experience then please get in touch. The private experience page has all the information you need, plus you can read a growing selection of testimonials from fans who have already starred in their private Splat! Show experience. Our MASSIVE Season 16 Finale is out now! It may be a few months late, but our season 16 finale is here! We had the pleasure to welcome partners Angel and Joe onto The Splat! Show to star in our massive and epic season finale. We guess this is our second Boyfriend Vs Boyfriend show too. Can you believe the first with Ben and Jordan is two years old this month! Splat! Fan club members have already seen that this show is absolutely epic looking, with six mighty fine tankings. Angel and Joe were on top form with their joyful and fun personalities that really made this season finale show sparkle. Go and check out the show now! Our next 15th anniversary event video has just been released. It’s a tad smaller in scale after our first with Sam Callahan as we continue to work hard on the next season but we think many of you will enjoy this special release. We couldn’t celebrate our 15th anniversary without Jon. Jon has been a fan favourite for a number of years now and he recently made a surprise visit to the show to wish us happy birthday. Of course we had to shoot something with Jon, after all it’s been nearly a year since his last Splat! Show appearance. Jon was of course game and agreed to brave the tank full of cold gunge from a private experience two days earlier. Jon also took on the return of the MEGA Gunging to finish off his visit. If you visit Splat! HQ it’s safe to say you’re gonna get messy, even if you are here with good wishes. The video, Jon’s Surprise Visit is available to download and enjoy now! Oh and we have just finished negotiations for our next BIG guest for the next 15th special! We hope to reveal all soon! New Splat! Club Exclusive Video Series: Who’s Under The Foam!? The Splat! Fan club today has debuted the first episode in our brand new Splat! Fan Club exclusive series, Who’s Under The Foam!? Available to watch right now on the Splat! Fan Club is the first episode. Can you guess the identity of the mysterious guest under the foam? You are given hints via questions as you watch and then of course you get to see if you are correct when the tank “cleans off” the foam with gunk revealing the true identity of the participant. the Splat! Fan Club today to view the first episode of Who’s Under The Foam!? along with all other club content including all episodes of Flans From The Flans, yet another fantastic Splat! Fan Club exclusive video series. Steve P.T Returns: First Show and Pre-shoot Content Offers! – Extended! 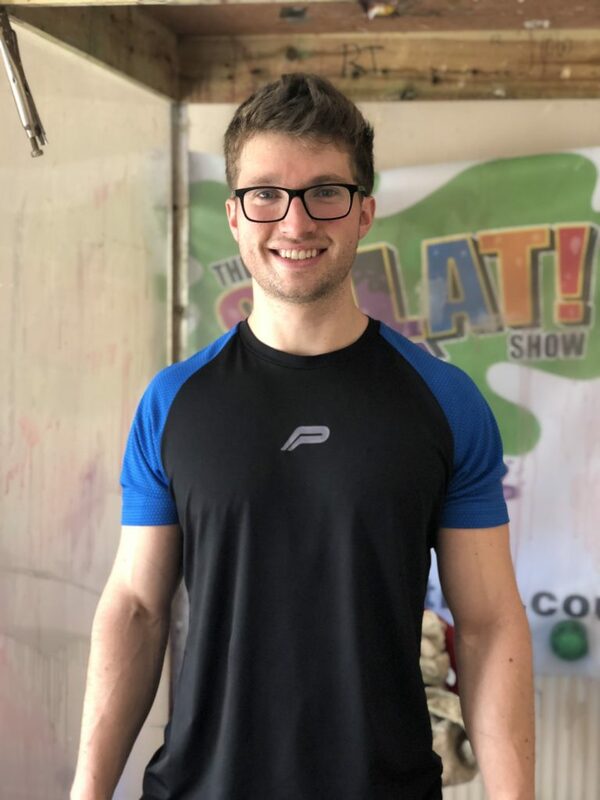 We had the great pleasure to welcome personal trainer Steve onto the Splat! Show earlier this year. We really enjoyed having Steve here at Splat! HQ and for the past few months Splat! Show producer Tim, who recently worked on Sam Callahan’s Splat! Show, has been beavering away to make Steve’s return to the Gunge Tank a possibility. With Steve’s return on the horizon we have cut 50% off his first Splat! Show and also released his Splat! Storm and Gunge Tank vote from the Splat! Vault. These offers have now been extended until we shoot again with Steve who we hope to set a date with soon. Steve’s first Splat! Show will be unavailable when we release his brand new show! We are delighted to announce that our first 15th anniversary special starring the wonderful Sam Callahan is out now! It was a pleasure to have Sam on the Splat! Show after a tough few months for us and we really hope you enjoy it. Welcome to our brand new website. We have been planning the move to our new website for over a year and today the new site is operational. We have given the site a brand new look. Our old website was built using old software that is no longer being supported. We hope you enjoy the brand new website. We have added more pages detailing every aspect regarding the Splat! Show and we feel it’s a vast improvement over our old site. So please have a browse and tell us what you think. We will continue to make tweaks and changes over the next few months. The page you are on now is our brand new news page. Here you will find the latest information and news regarding the Splat! Show. Our new menu bar at the top of the page is present wherever you are on the site so you can easily jump to any section you wish.